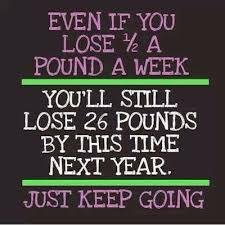 Keep going and you will lose weight! Looking for motivation to lose weight? Have trouble maintaining a diet and exercise schedule? Well, the thought that you want to lose weight helps you win half the battle. You next just need some focus and motivation to push you along the road. The best motivation you can receive, or expect is to get surrounded with slim people. This doesn’t mean you have to forget your old friends who are not slender! But it’s just been proven through research that the average body height of the people you hang out with does have an effect on your weight and size. So try to hang out with the slimmer and fitter people around you, perhaps with your gym members. You will slowly but surely start picking up a template defining ‘normal’ in your subconscious mind. By hanging out with them, you learn some of their habits, what their everyday routine, how much and how many times they eat a day, what they eat, how much they sleep and lots more. Implementing even an ion of what they do to your daily routine will have a huge impact on your weight loss endeavor. Learning to be fair to yourself also provides the required motivation to lose weight. No one is perfect at everything. Just because you missed out on your diet one day because of a weak moment and ate more than you should have, it doesn’t mean that you have failed. Remind yourself of the weight you’ve already lost, and the amount of exercise and dieting you have already done. You can’t be perfect as its normal for everyone to eat sensibly and healthily most of the time and not all the time. It’s okay if you eat the wrong food or drink once in a while as you are human being, and at times, do succumb to temptations. One important piece of motivation to lose weight is to remind yourself that everyone’s weight tends to fluctuate even after reaching a healthy weight, so it’s okay if you do too. Keep a sliding scale in mind where you permit yourself to slip a few pounds on either side of your target weight as it’s too harsh and dictating on your body to live under a self-imposed diet for long! It is true that you want to lose weight to look better, feel healthier and have a slim body. But you need to realize and know that your losing weight will not cure all your problems in life. Everyone has loads of problems, and being fat is one of them. So by losing weight you only manage to solve one problem. Other problems like finances, personal problems and work problems will still go on. So don’t let these problems be the reason for your returning to your eating poorly again and stopping exercise! Remind yourself that there are lots of problems you have to overcome in life, and losing weight is only one of them. This thought itself should give you the required motivation to lose weight and keep it off no matter which problems you face in life!